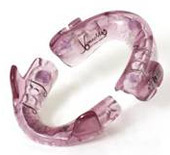 The SomnoMed MAS™ is an oral appliance, which fits over the upper and lower teeth, much like a sports mouthguard. However unlike a sports mouthguard it is a precision-made, clinically-tested medical device. It is highly effective (in most cases) in stopping snoring and treating obstructive sleep apnea in the mild to moderate range. The medical term for your lower jaw is ‘mandible’ and an oral appliance worn over the teeth is a ‘splint’, hence the name SomnoMed Mandibular Advancement Splint, or SomnoMed MAS™. 1. It’s comfortable. It is the most comfortable and discreet mandibular advancement splint available. 3. It’s good value. Given the quality, comfort, likelihood of success, manufacturer’s warranty and long life of the appliance, it provides true value for money. You won’t find a more comfortable MAS. Why? Because it is tailor-made to fit your mouth; it does not impinge on your tongue inside your mouth; you have normal open and close jaw movement; you can even close your mouth and lips to avoid a dry throat. New users sometimes feel some discomfort in the first few days of wearing it, but in the majority of cases, such discomfort passes quickly. What Causes Snoring and Sleep Apnea? When the airway narrows or partially collapses snoring results, which is the sound of tissues vibrating. Where there is complete collapse, you have an incidence of sleep apnea, which is when breathing stops altogether. The SomnoMed MAS™ positions your lower jaw slightly forward of its natural position, which has the effect of tightening the soft flesh (or ‘tissue’) at the back of your throat, which prevents it from collapsing. The patented fin-coupling mechanism on the lower arch of the SomnoMed splint ensures that your lower jaw (mandible) remains in the correct position, whether you sleep with your mouth open or closed – or open your mouth for any other reason, such as to take a drink. This freedom to move your jaw up and down, without compromising the effectiveness of the device, is a unique feature of the SomnoMed MAS™. The SomnoMed MAS™ has been tested in clinical trials, with the results published in prestigious medical journals. It is the only oral appliance with such a body of clinical research to substantiate its effectiveness.